What comes after the selfie? It’s surely going to take a while to find something as effortlessly addictive as documenting our own facial features repeatedly. But perhaps the current narcissistic obsession with selfies can be expanded to encompass ourselves and everything around us. That at least is the hope of the Berlin-based creators of Panono: a spherical camera that’s designed to capture a God’s eye, 360 degree view of everything that appears in a scene at the moment its shutters snap. And judging by Panono’s current Indiegogo crowdfunding campaign, the startup has successfully created a fair bit of momentum behind the concept. Panono has been running its crowdfunding campaign since mid-November — with the aim of raising $900,000 to turn its ball-shaped, camera-clad prototype into shipping panorama-capturing product. With less than a week left of the campaign to run, they’ve passed their funding target — and broken through the $1M mark. At the time of writing, Panono is just shy of $1,050,000 raised. What exactly is Panono? It’s an 11cm ball that has 36 tiny cameras fixed onto this sphere that are capable of snapping a 108 megapixel panorama photo. Alternative Panono panorama capture methods can include holding the ball up on a stick (in case you don’t want to toss it over a cliff, perhaps), or just holding it up in your hand and pressing a trigger button to fire the cameras. Siting a series of cameras on a ball to capture comprehensive visual data of an environment is of course what Google does with its Street View cars (and its people-mounted Trekker cameras), so the concept of arranging camera lenses on a sphere is not new in itself. But Google hasn’t been interested in pushing Street View image capture technology into consumer electronic hardware itself — leaving room for others to play. 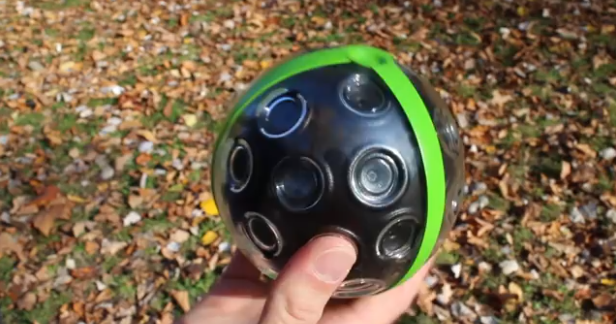 Panono is also similar to another spherical device startup called Bubl, with its Bublcam — which also recently took the crowdfunding route to get its own photo-capturing ball rolling. Bublcam’s campaign raised just shy of $350,000. Panono looks to be offering its spherical hardware at a slightly cheaper price-point than Bublcam ($500 for Indiegogo backers; $600 retail thereafter vs $800-$700 retail for Bublcam) — but Panono is concentrating on capturing high resolution stills, utilising far more camera lenses (36 vs four) in its design. Whereas Bublcam intends to offer the ability to capture and stream spherical video too, as well as take (lower resolution — 14MP) still shots. Regardless of Panono’s more limited functionality vs Bublcam (i.e. still shots and interactive panoramas only — no video as yet), it has managed to pull in considerable interest, with more than 2,060 backers thus far. It’s aiming to ship finished product to these backers next September. As for viewing Panonos, it’s making an Android and iOS app viewer for panoramas (or these will be able to be viewed via the web on the Panono Cloud). It will also be possible for users to access the raw 36 unprocessed single images if they want to play around with the data in other ways. The Panono sphere includes internal flash memory that allows for around 400 panoramas to be stored at any one time, i.e. when not sending the data direct to a smartphone or tablet via Bluetooth or Wi-Fi.